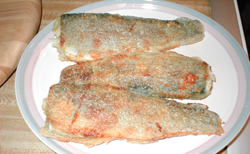 There couldn't be a better way to prepare freshly caught wild brook trout. 1 Remove gills from fish and discard. Rinse fish under cold water. 2 In a large skillet heat oil over medium heat. 3 In shallow dish, combine the flour, cornmeal, salt and pepper. Raise heat to high. flakes with a fork. Serve garnished with lemon wedges.